The oldest profession on Earth is not what you may think it is. As long as people have inhabited the Earth, this profession has existed. Think of the first inventions of mankind: Clothes to endure the elements, hunting weapons for food. People needed tools to make them. The oldest profession on Earth? Toolmaking. The first toolmakers were indispensable. But young people no longer choose toolmaking in the numbers they did. Even those who see plastics as a career choose design or engineering over toolmaking. You may argue we don’t need as many skilled toolmakers adjusting spindle speeds and table feeds because CNC machines do that automatically. You wouldn’t be entirely wrong, but you’d be missing the point: Toolmaking is more than the art of cutting and fitting—it’s the science of creating something useful. It’s understanding a need and manufacturing a solution. I went through a toolmaking apprenticeship. I was taught to think in black and white: An idea works or it’s garbage. It’s been said that good toolmakers have fingers of gold. They create value-added products. 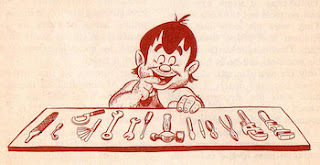 If you look around you’ll find many toolmakers own plastics companies. The skills they learned in their profession gave them the opportunity. Is that not a desirable career path? What makes a toolmaker good? Invariably, it’s the intangibles: The ability to see a workable solution to a manufacturing nightmare; to suggest improvements to a design; to know what works and what won’t. It’s not a question of intelligence, but of having the knowledge that comes from experience. This is the essence of toolmaking and why apprenticeships are vital. Everyone talks about the importance of apprenticeships, but we should do more. In the United States, programs exist that contribute half of an apprentice’s wages. The National Tooling and Machining Association and the Society of the Plastics Industry are creating guidelines for apprenticeship standards. But the effort should come from companies. For example, Tech Mold in Tempe, AZ, has had a successful program for several decades. The company understands that to reap the benefits of apprenticeship programs, it must incur some cost and risk (such as the occasional apprentice who leaves at the end of training). Tech Mold will tell you what it took to make the program successful: Patience and total commitment. Some of their best toolmakers are graduates. Mold-Masters has an 8000-hour program that combines a four-day work week with a classroom day. We accept the cost because existing educational methods don’t work. Bring students to industry. Use the industry infrastructure of machines, bricks and mentors. Toolmakers remember how important it was to have a mentor, and most take pride in tutoring others. It’s a simple, workable concept. It’s unfortunate, however, that in most countries there is little government assistance for companies that use their machines for training, or for toolmaking masters who share their knowledge. Maybe if there was greater assistance, we wouldn’t be faced with a shrinking supply of toolmakers and companies wouldn’t be so concerned about the cost of apprenticeship programs. But when you think about it, the cost of not creating tomorrow’s toolmakers is higher. As someone who thinks in black and white, the question is simple: Are toolmakers needed? If you answer yes, do something to save the oldest profession. Promote toolmaking and apprenticeships at every opportunity. Create apprenticeship programs within your organization and remain committed to them. Let’s not wait for the government or industry organizations to decide what we need. We need designers and we need engineers. And, as proven by hundreds of thousands of years of history, we need toolmakers. Industry has the infrastructure and the mentors to produce them. All we need is the patience and commitment to bring this effort to fruition. What Gellert said two decades ago holds true today, perhaps even more so. We’re losing our long-time, experienced moldmakers, and when they retire, we will lose the “tribal knowledge” that is so important to the mentoring of which Gellert wrote. It’s time that the industry take Gellert’s advice and create a future for the industry and for the many young people who will find a great career in toolmaking . . . if they are given the opportunity.